I didn’t anticipate a PR due to inconsistent training / not enough runs under 9:00/mile pace. Nevertheless, I psyched myself up in the few days before the race, putting on a PMA (that’s “positive mental attitude,” as my college track coach would tell us), and decided just to run and see what would happen. I had goals of 26:00 for the 5K and 52:00 for the 10K. My general goal was to be under 1:55:00 (but around 1:50:00 would be nice). I knew the course would be tough — hilly — but the weather was supposed to be perfect. Long story short, I actually met all of my goals. The weather was gorgeous — about 60F and sunny — and I felt good after walking to the start and jogging around a little. I found my friend and fellow PCV, Andrew, at the start — this is the third race we’ve run together since being in Ukraine — and off we went. The first 5K were mostly downhill with some cobblestones at the beginning — oh, Europe — down Volodymyrs’ka from St. Michael’s Cathedral. My (Ukrainian) friend and fellow runner, Ruslan, passed me early on as he led the 1:40:00 pace group. I was right at 26:00 for the 5K — “just maintain,” I thought. I’ve never been a mantra person, but one just came to me and I often returned to it throughout the race: I am well-fueled, I am strong, I am fit. Around 5K, we started a gradual ascent that lasted for the next 4K or so. The 1:50:00 pace group caught me at one point and an older man in yellow yelled some encouragement to me in Russian (he’ll return later on). We turned around just past 8K and I caught and ran alongside a tall girl in bright blue running gear — she definitely helped keep me going for a couple kilometers. I was a spot-on 52:00 at the 10K, then dropped blue girl when she paused at the next water stop. Uphill again as we ran back toward the city center and turned right on Saksahans’koho. I’d be happy if I could hit 1:18:00 at 15K, so I surged on, taking a bit of fuel (in the form of Honey Stinger gummies — they’re delicious). I was happy to turn onto Saksahans’koho to get out of the direct sunlight. My watch read 1:17:00 at the 15K marker — with burning hamstrings by this point, I had a feeling the 15K sign had been placed too early. “6K to go,” I told myself, and my mantra popped back into my head. We turned onto Chervonoarmiyis’ka, up a hill that Kim and I ran/jogged/walked up way too many times during last September’s Kyiv Marathon. We’d turn onto Khreshchatyk soon, run all the way down and then turn back either just before or just after 18K — I couldn’t remember. The turnarounds were nice because we could see the people ahead of us running back toward us on the other side of the road. Down Khreshchatyk, I counted PCVs (whom I knew — maybe there were others I didn’t recognize) in front of me: Brian, then Ellis, then Andrew, Ali, and John. The older man in yellow, who had been with the 1:50:00 pace group, passed and yelled to me, “Ми вас підтримуємо!” (we support you!). Maybe he liked my crazy pink and black running capris? Finally, I reached the turnaround: 3-4K to go. All uphill. (Balls.) Back up Khreshchatyk, then left up a steep section, right past the bright red and tangerine Kyiv National University buildings, all the way up cobblestoned Volodymyrs’ka back to St. Michael’s. Did I mention it was uphill? 20K came when I hoped it had already passed. My watch read 1:46:00 or so — no PR today, but I tried to get my aching hips and hamstrings into another gear to finish strongly. Past St. Sophia’s Cathedral and I began to kick as well as I could. Passed a couple of people on the homestretch to finish in 1:51:23 (my watch time — the official clock read 35 seconds but they were hand-timing and I had started my watch right when I crossed through the start). Finished — finally! I glimpsed Ruslan and we congratulated each other — he’d brought his pace group in at around 1:38:00. The older man in yellow found me to offer his congratulations — he asked me where I was from and when I said the States he complimented my Ukrainian and said he’d thought I was Ukrainian (while running); I understood that he’d been excited to cheer me on because not so many young Ukrainian women are such “спортсменка” (sportsmenka — sportswoman). (Though I saw some of the lead women going past early in the race and they were great runners.) After chatting with a few PCVs, John and I headed back to the hostel, beat. I should mention that there was a fantastic turnout of PCVs running both the 5K and half marathon on Sunday — not to mention the ones who just showed up to cheer us all on! Two Years Ago: Weekend in D.C. 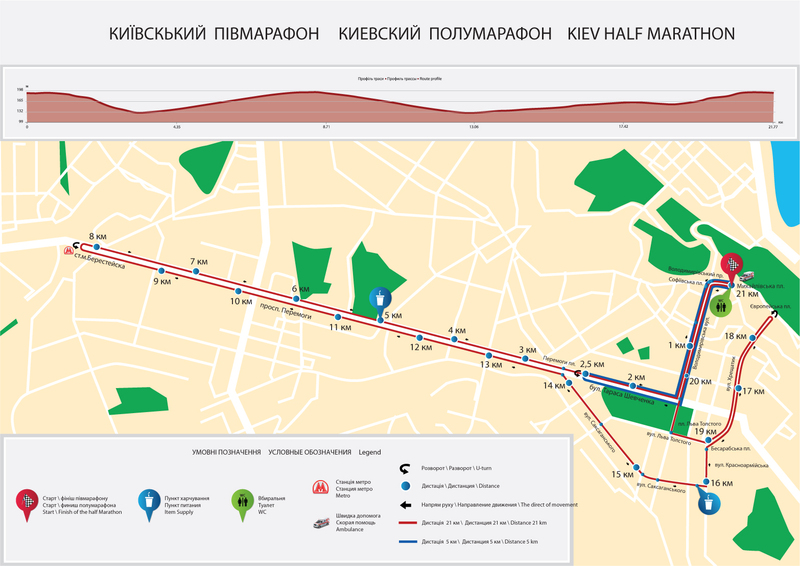 This entry was posted in climate, exercise, geography, health, Highlights, Kyiv, Race Recap, running on 17.09.2012 by taplatt.